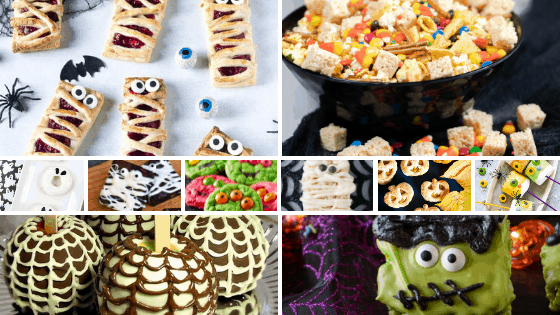 If you’re looking for Easy Halloween Treats for School – look no further! These treats are nut-free, easy to make, and perfect for class parties! Your child’s classmates will be sure to love them. These treats are all also easy enough to make with your children. Kids love to make handmade gifts, why not let them help make handmade Halloween treats for for their friends? This super cute and fun Rice Krispie Treat creation is something the class will love! These Hand Pies are a great alternative to the traditional sweet treats that are handed around in class. They’re adorable and yummy, too! These super cute and easy marshmallow pops are so easy that the kids can help make these treats to give out in class. If you’re running low on time this snack mix is the perfect answer! It’s as simple as throwing everything into a bowl, giving it a shake, and dividing it up into bags! These adorable donuts are another quick and easy treat to make for class parties. It’s one the kids are sure to love! Halloween Mummy Brownies from Lights, Camera, Bake! These Mummy Brownies are so simple to make that the kids can help out with these, too! You can make cookies for your child’s class party and let your kids have fun making the faces! Not one will be the same! These cute Mummy Pies are perfect to give out in a goodie bag to classmates! Mix a Fall favorite with Halloween by making these apples dipped in chocolate! Also great for goodie bags! Another quick and easy Rice Krispie Treat creation to make for class. The kids will love the white chocolate flavor! Such a great selection of cool Halloween treats here! Thanks for including my marshmallow pops!